OfficeSpace.com.au has serviced and shared office space in the Melbourne suburb of Glen Waverley. Currently available for occupation at short notice on flexible rental terms, these Melbourne workspaces are offered without the long-term commitments and high overheads of conventional commercial real estate leases. Our well placed office suites are situated in prime Glen Waverley, VIC business locations and benefit from a wide range of services and amenities. Glen Waverley is a suburb in Melbourne just east of the CBD and the site of thriving retail and entertainment commercial sector, as well as a secondary business hub. It is the site of the national headquarters of several international companies including Nestle, BMW, Ansell, Toshiba and NEC. A railway station in the suburb and close proximity to the CBD give fast transport. OfficeSpace.com.au offers businesses of any size a simple, quick and affordable way to rent temporary office space in Glen Waverley. A number of the office buildings we list have facilities like manned receptions, fast internet connectivity and telephone lines. This can help remove the usual process involved in setting up an office, and let you focus on getting up and running. A wide selection of the business centres are inclusive of a range of services which include office administration, reception and on site IT support staff, internet and WiFi services, lounge and meeting room services. In addition, a number of the office buildings provide free car parking, 24 hour access, dining facilities and break out areas. 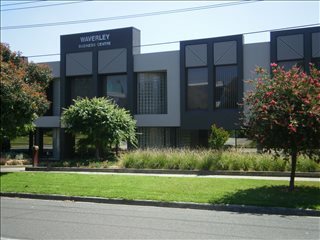 Choose one of the offices or executive office suites in Glen Waverley listed on this page. The office space listed on this site is in an excellent location, and is available for instant rental on flexible terms. As well as the office space listed above, our team can also provide a wide range of executive office suites in ideal locations in other cities in Victoria, available on flexible terms to suit your company's needs.